Goats are cute, add in a bit of attitude and that they are the source of chèvre, and they are wonderful. I had a milk goat once, my boys drank goats milk for a couple of years. 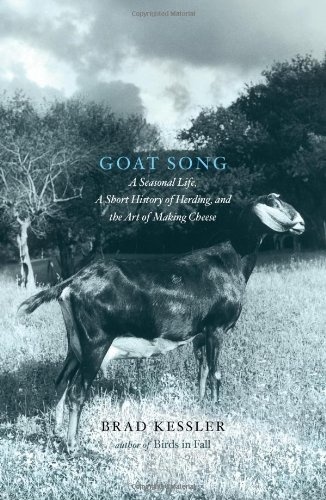 Brad Kessler’s Goat Song: Seasonal Life, A Short History of Herding, and the Art of Cheese Making triggered warm memories of morning and evening milking chores from all those years past. 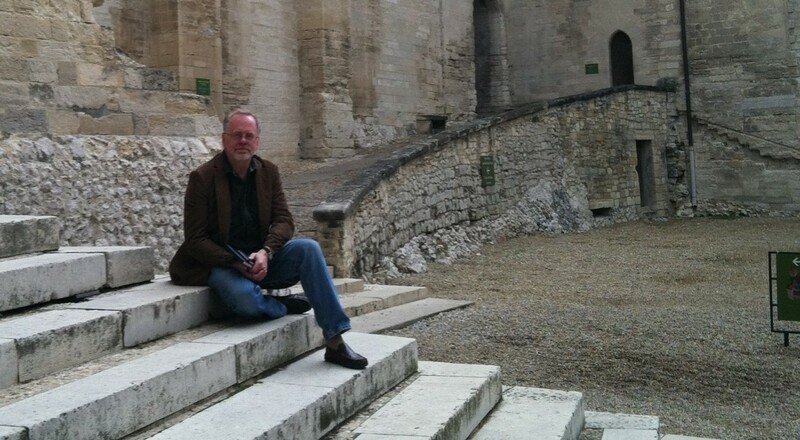 Goats have assumed various roles throughout history, Kessler’s novelist writing skills makes these stories come alive. Goats have been connected with poverty, with Satan, and a myriad of other odd ideas. BUT goats have been the means of existence for many peoples in many lands, and like I said goats are cute. Brad and Dona Kessler bought a run-down farm/orchard in Virginia. They wanted goats. Hannah the queen of the herd, and Lizzie were their first two goats. For them to have milk and cheese they first needed kids. His account of breeding and birth is poignant and sensitive, yet it will be foreign, even challenging, to those who have lived only an urban life. Hannah and Lizzie provided them with their milk, goats milk is responsible for so much of the good cheese in the world. Kessler writes of the wonderful first batch of creamy cheese and the evening they spent eating it. TheWinsketcher could only think of which wines would have fit. This is a good read, a pleasant diversion. Like a walk through pastoral fields in the midst of this crazy world. A reminder that food is not from a factory but from the earth and the herds, try as we might we are in the end connected to both. Reading this book has been a delightful mental gymnastic. Einstein occupies legendary status – genius, formulas, time, gravity, and relativity – all are concepts that evade most of us; this was my motivation in reading this book in the first place. Isaacson includes detailed discussions of how Einstein arrived at some of his formulas and theories. I have a bit of a science background, but theoretical physics and the mathematics that goes along with it has always been a stretch for me. Yet, as challenging as it was, I did grasp enough to give me a better understanding of the world-shattering nature of his discoveries. I still struggle that there may not be simultaneous events, that time is curved, or that light is bent by gravity, yet when Einstein explains it there is sense about it, and it does fit what you see. Though he was not at all a religious man, he was convinced and argued for the idea that “God would not play dice with the universe.” He opposed quantum mechanics to his death because it is based on randomness and probability. Einstein never was able to define a unified system that explained how all physics worked and connected, he was certain that it does exist and would be discovered one day. As fascinating as his physics was, his personal life and his political thinking were just as intriguing. His theories were essential for the development of the atomic bomb, yet at his heart he was a pacifist who believed that there should be a world organization that prevented, by force if necessary, countries from going to war. This along with his socialist thinking earned him the label of communist, he was clear that he was opposed to communism because of its dictatorial nature. Since Einstein died when I was quite young I was surprised at the celebrity status he enjoyed/hated. There were parades held in his honor and he was frequently asked to support causes, which he rarely declined and as a result ended up being associated with organizations that damaged his reputation, and who he really did not embrace. A good read, challenging at times, but needed insight into one of the greatest thinkers ever, and a major influencer of the last century. The more I learn about how and where our food comes from the more I am convinced that we need to give it a lot more thought. We need major changes in what we eat and how we raise it. Animal, Vegetable, Miracle is one of the best I have read, it and Omnivores’ Dilemma are must reads. We are actually reducing the varieties of food we can grow, killing off forever many delicious fruits and vegetables in favor of GMO’s that withstand herbicides. Large segments of our society have no idea where food actually comes from. There are accounts of grade school students that were shocked to find that potatoes are plants with leaves and such. I was a sales manger for Pacific Fruit and Produce, before they became Food service of America. I remember the banana and tomato rooms. The fruit would be trucked in green, placed in these temperature controlled rooms, the room is filled with ethylene gas so the fruit can turn yellow or red; not to be confused with ripe. So the tomatoes are red, but have the flavor of cardboard. Compare some day a tomato grown in Chile, with one grown local, or from your own backyard. The similarity is only in the color. We need to get back to local. Reading The Ominvore’s Dilemma, Tricia referd it and it is one of better books I have read in a long time. Michael Pollan explores where what we eat comes from, so far I have learned that most of what we eat is connected with corn in some way or another, I had no idea how much. I even thought that “citric acid” on the ingredient statement menat it had something to do with oranges, nope it comes from corn. And “Corn fed beef” is not natural, cows cannot digest corn naturally, but corn is cheap and fast so we give them drugs to be able to digest it as it gets them fatter and bigger faster. Pretty much the closest we can come to a factory that makes beef. Worth the read, yet I do think the book will leave me in a dillema, but at the same time it reinforces my commitments to eat local, true organic (technically organic just means it did not come from petroleum).